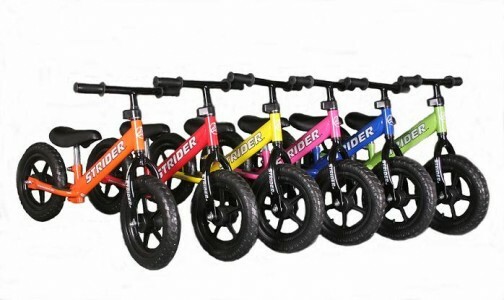 Strider builds innovative bikes to help kids learn balance earlier, and thus get riding sooner. Kids will learn balance pretty quickly, with these bikes, and then when they get a bit bigger and are ready for a pedal bike all they need to do is pick up there legs and start pedaling! "What is a balance bike? Balance bikes are a very simple bike designed to teach young children how to steer and balance on two wheels. Balance bikes are designed with only foot propulsion to teach the fundamentals of riding. When the fundamentals of balance and steering are mastered, transitioning to a bicycle with pedals or motorcycle is easy. When learning to ride, a child needs to experience the feel of leaning and how steering affects the balance of the bike. Without leaning, such as on a tricycle or bike with training wheels, they aren't really learning to ride at all! By starting out on a balance bike, your child will develop balance, coordination, and confidence!"